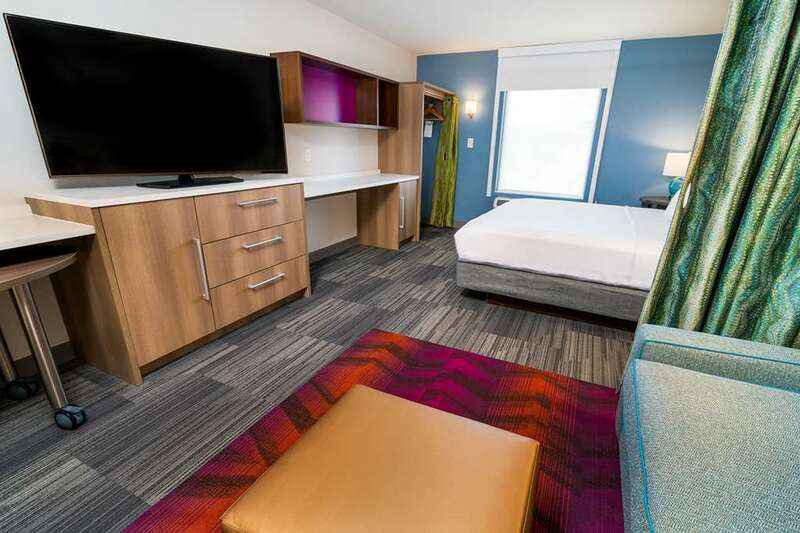 Whether you are here for business or on vacation our new Home2 Suites by Hilton San Antonio at the Rim is the perfect home base for your stay. We are conveniently located just off I-10 across the highway from Six Flags Fiesta Texas and surrounded by shops dining golf courses and entertainment. We are just five minutes from the University of Texas at San Antonio and 20 minutes from downtown. After a day of fun or work spread out and unwind in our spacious suites. Enjoy a swivel HDTV sofa bed free WiFi and kitchen with full-size appliances. Sleep well in a comfortable king- or queen-sized bed. Pets are always welcome too. If you have a large group ask about our connecting rooms. Start your morning with free breakfast at our Inspired Table including fresh fruit oatmeal waffles eggs as well as 24-hour coffee and tea in the Oasis. Our 24-hour Home2 MKT offers snacks drinks and travel necessities when you need them. Our outdoor saline pool is perfect for the kids to play or for doing laps. Work out in our spacious Spin2 Cycle facility and run a load of laundry while you run on the treadmill. Fast casual family restaurant that specializes in breakfast food. BJ*s Restaurant - Brewhouse the place to go when you*re looking for amazing craft beer delicious pizza selections and an extensive menu of high quality food--all in a fun casual accommodating setting. A traditional American Prime Steakhouse combining simple elegance a lively atmosphere big drinks fine wines and large cuts of the finest prime steaks chops and seafood for an unforgettable steak experience. An original american concept with an eclectic freshly prepared menu with playful global influences. At Paula Deen*s Family Kitchen guests will enjoy classic Deen family recipes in a unique family-style setting just like they do in their very own homes.